Recently, the team over at Edamame Reviews created a new developer tool ranking system to help game developers decide on the best game building software and frameworks in which to use. According to Edamame Reviews, the data shown in their ranking of the most used frameworks were collected directly from Review Submissions sent in by mobile app developers and is the most accurate and unfiltered data available. Buildbox was ranked in 3rd place as the most popular developer tool with 11.1%. Although Unity was in 1st place followed by the framework XCode as most used, being ranked alongside the top contenders in the industry is not only an honor but a huge accomplishment as well. We’re also the highest ranked codeless game builder on the list. For those unfamiliar with the site Edamame Reviews. It’s a mobile game review website that likes to predict what’s coming next in the world of apps. Along with new daily app reviews and postings they also feature a weekly ‘What’s Trending?’ page where they spotlight a popular game theme. Edamame Reviews will continue to update their Developer Tool Ranking page every single Sunday to keep devs informed. It’s a very cool feature and we’re looking forward to seeing more results as they unfold. I find this article very hard to believe. I’m currently evaluating engines, and seeing Buildbox 3rd, when Buildbox holds a very, very tiny fraction on game engines, is just impossible to accept. It seems like you’re trying really hard to twist and bend the actual facts, to create a blog post with a very misleading headline. This is not unlike the tactics many propaganda news sites employ these days, which is unfortunate, but i thought u were better than this. 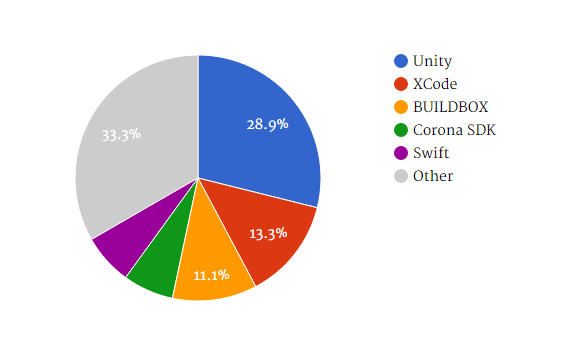 If people reading this are unconvinced, take a look at the size of community (forums/etc) that competitors have (Unity, Xcode, Swift, Construct 2, Game Maker Studio, GameSalad, Flixel, I could go on forever…) and then take a look at the size of buildboxs’ community. I’m not saying Buildbox is a bad product, it’s not, but it is WAY to early to be making claims like this. Come back when you have at least 1-2 mil registered users on the forums. On further research, ‘Edamame Reviews’ is a very obscure website that has a suprisingly big share of buildbox games. Not sure if you’ve made a deal with said website or not. But I’m willing to admit I’m wrong, if you post similar results of more known websites (Steam, Kongregate, Newsgrounds, app Store, etc), but I sincerely doubt 0.0000000001% of games in Steam were made in buildbox, so you can see how I take issue with the blog title “Buildbox ranks as 3rd most used developer tool”. Didn’t mean to sound harsh, but this post upsetted me. I’m liking buildbox trial so far, so I want to see how this software turns out, but keep it real, and true success will come, I’m sure. I’ll give you the benefit of the doubt and wait for your reply before blogging about all this. I believe you misinterpreted the point of this post. We are the newest game building tool on the market and obviously have a much smaller user base than companies that have been in existence for nearly a decade. (That said, our customers have had more success than every other game building platform as seen on our All-Stars page). Regardless, I can assure you the point of this post was not to confuse people into thinking we are near the size of Unity or bigger than any other software’s user base. Instead, we thought it was cool, and newsworthy, that we were ranked as the 3rd most used tool on a new review site. It seems what confused you the most was our headline. I’ve changed that to make it more clear, but again, my intention was always to keep this transparent, hence the picture showing Edamame Reviews. Thx for the reply. I see what you’re saying, you’re trying to say one thing, but when summing it up as a sentense, it comes up differently. I see this a lot and sometimes catch mysef doing it myself. Which is how I got good at catching them in the first place. See your latest reply. “We are the newest game building tool on the market”, and “our customers have had more success than every other game building platform”. I know that you mean, “We’re relatively new” and “our games do good on app store”, but someone else might see that and think.. waiit a minute… no they’re not. Btw, I’m just giving advice to a fellow writer, I harbor no ill feelings. I’ll be looking very closely to Builbox 2 and will be rooting for you. Thanks. Yes, in my latest reply I meant more than any other drag and drop game building platform. To be clear, our customers had more featured and top 100 games than all other Drag and Drop game building software platforms in 2015. Not including Unity or coding platforms like Swift or Coscos2D.